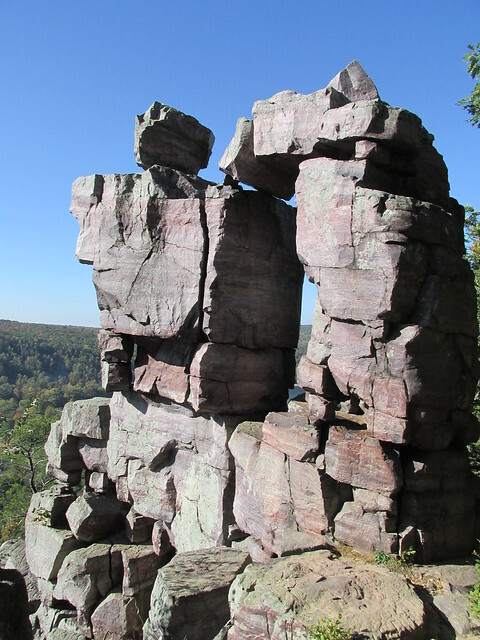 Recently, our son and a friend casually mentioned that they were considering a hiking trip to my favorite WI park which quickly made me think fast. I knew they were both college students and, let’s face it, always tight on money, so if we offered to drive and supply lunch they may let us tag along for the day. So, the offer was made and by the next morning excepted…..which made this mom very happy. 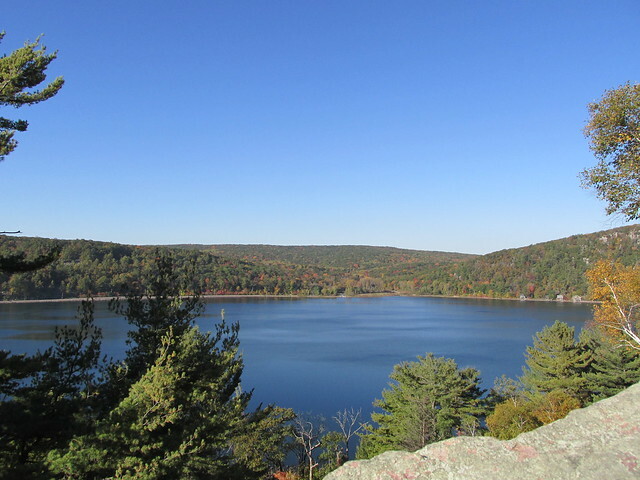 I wish we lived closer to this area because this would be where I would spend a great majority of my time, hiking in Devil’s Lake State Park. This park literally has everything we love, well almost, it does not have whitewater rapids. It does have a lake for standup paddling, fishing, and swimming. 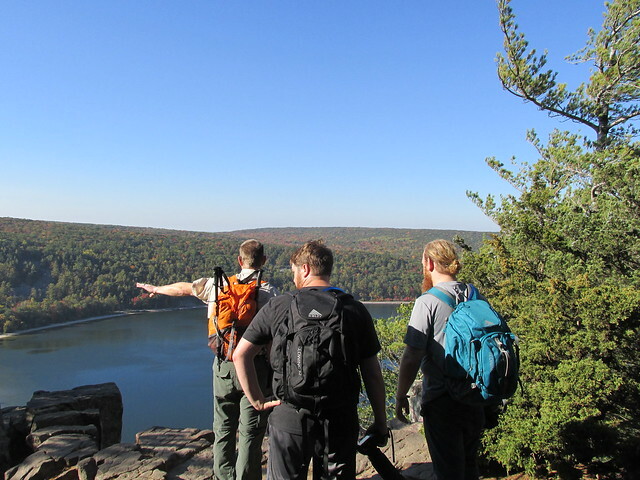 It has bluffs to climb and hiking trails that are well marked and fun to hike. And the view is as good as it gets in Wisconsin. Since both our son and his friend are photography students, they each had their backpacks loaded with camera equipment, which meant I had the pleasure of trying out my new Gregory backpack. (Which I LOVE) My husband had his backpack which started out empty since we began hiking when it was pretty chilly. 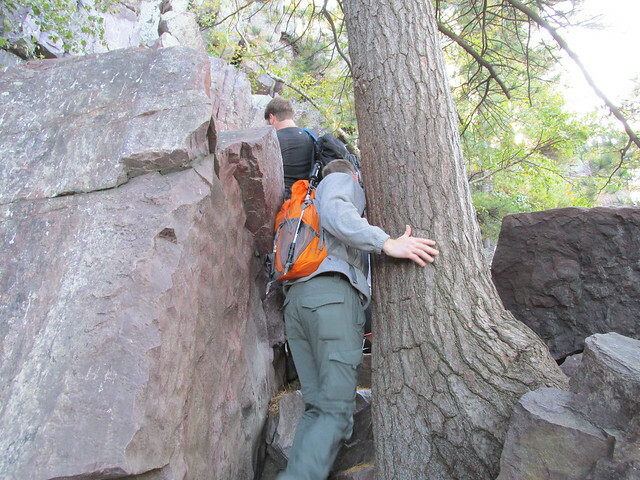 As the temperature quickly rose, we started peeling layers off half way up the bluff and loading it into his backpack. 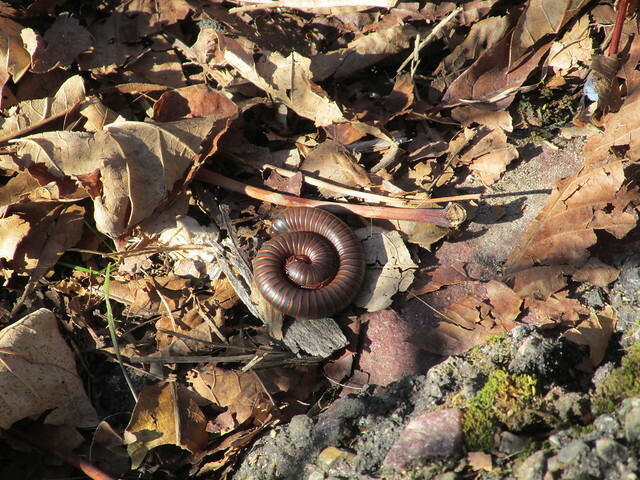 Our new hiking companion had never been here before, much less hiking anywhere for that matter. They have been doing little bits and pieces around home but this was by far the biggest hike he had been on. If only he could have seen his facial expression upon walking up to the trail head, it was photo worthy in my opinion. I hopefully put his mind at ease by reminding him that slow and steady is the key to success when hiking up cliffs/bluffs and that when he needed to stop and “smell the roses,” or catch his breath, to do just that. We have done this hike a hundred times, so we knew exactly what was ahead. For him, this was truly a new adventure which we were hoping to make a big success. By the time we reached the top everyone was warmed up and ready to explore. Then it was time for a little break. We found a sunny area and all shared a snack. After numerous pictures were taken it was time to head back down. It was not a long distance hike by any means, but it was successful. Anytime we can share our love of the trail with someone new is a success in my eyes. 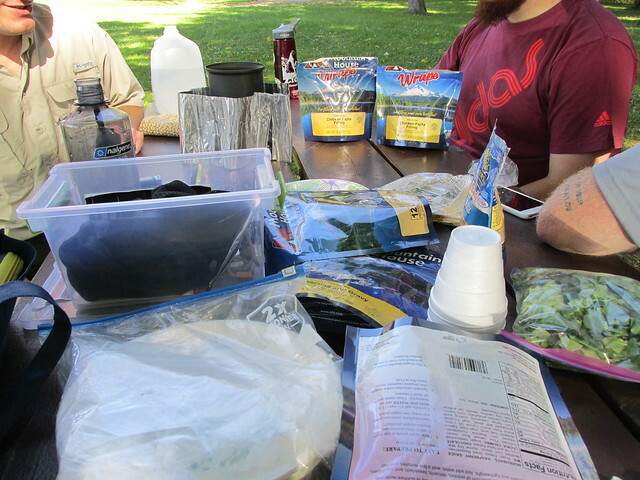 Then it was picnic time and we decided since we were not sure until last minute if we would actually be able to join them, that freeze dried meals would be easiest and fun for this newbie hiker to experience. 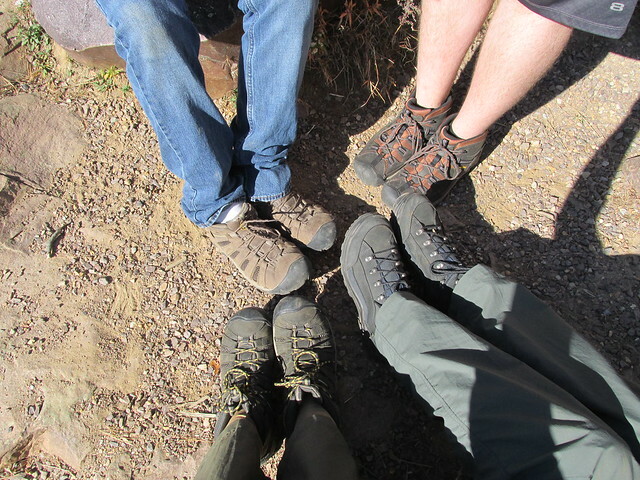 It ended up being a wonderful day of hiking and getting to know a new friend a little more. We returned to 80 degree weather at home and even managed to get a little yard work done before the sun set. This weekend I tried making a few do it yourself backpacking meals. We love the brand Mountain House but they are pretty costly and many times there is just too much in one pouch for one person. Yes, we could share a pouch but the three of us all have different tastes and it never seems to work out where we are able to share. Which got me to thinking…..could I make my own meals cheaper and in the appropriate portion sizes that we would be able to finish the entire meal? The answer apparently is a big YES! I passed with flying colors after we all did some taste testing this weekend. First, I did some research to see what has worked best for other backpackers. Quart size FREEZER bags are important. They are thicker than storage bags and don’t burst when adding boiling water. You could also prepare the meals and store them in bags, then when your ready to cook them do it in a covered insulated camp bowl. Although, this is often more than backpackers care to carry with them. 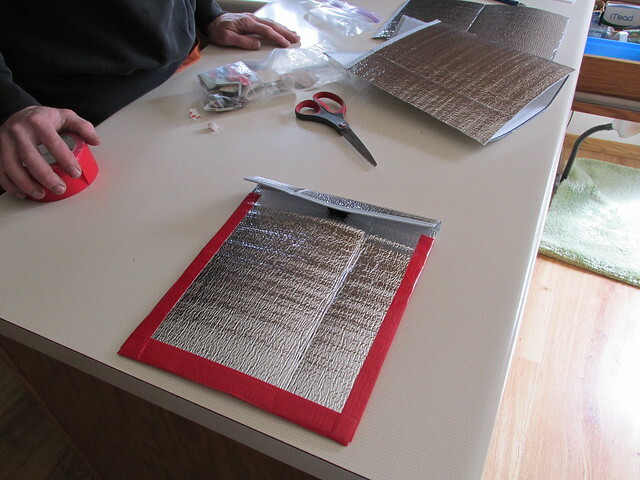 Next, I needed to make something to insulate the bags for the appropriate amount of time for the food to rehydrate. Many backpackers make their own bag cozy out of insulated reflective bubble wrap. So I made a trip to my local hardware store in search of this product which I could not find but decided to use a vehicle reflective window screen instead. This worked out great, was easy to cut out, and made three cozies with some to spare. And you could not beat the price…. a whopping $6. Then it was time to prepare my meals. 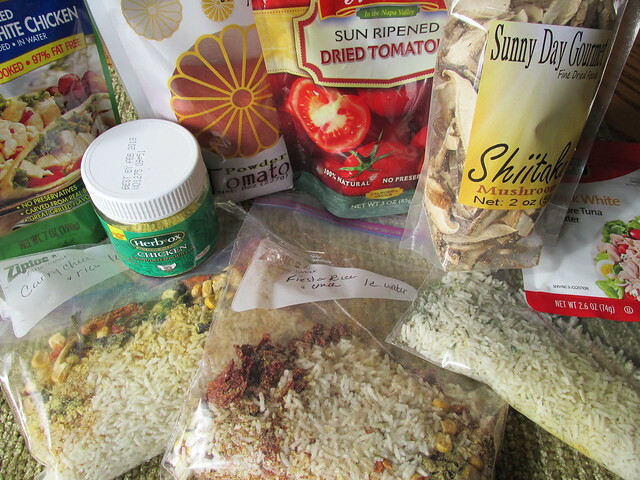 I had some ideas, had purchase things like freeze dried mushrooms, tomato powder, freeze dried fire roasted veggies, tuna pouches, chicken pouches, bouillon granules, dried fire roasted tomatoes, couscous, minute rice, quick cooking pasta, and so on. I did not need to purchase any spices since I already had a good supply of everything my family likes. I started mixing together things in the bags I knew we would enjoy. And came up with a few trial meals. Wait time is over and it’s time to taste. Success all the way around. We each tried every one and then picked our favorite to finish for lunch. I was happily surprised that I pulled this off on the first try. So now since we all enjoyed them I plan to share each recipe with you. 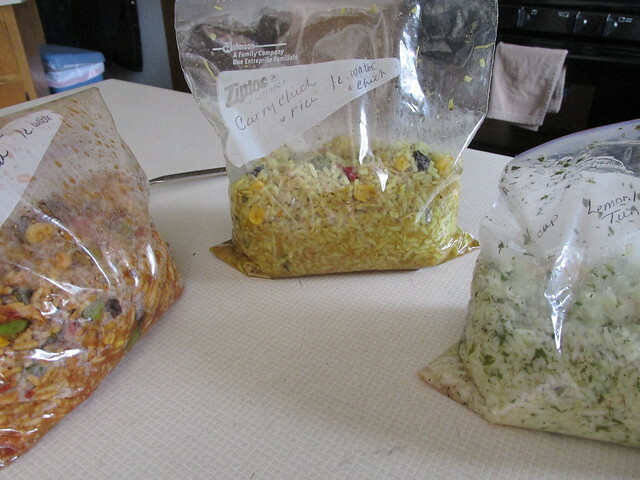 For the next few weeks watch for a new DIY backpacking meal to be shared. Also, keep in mind, you don’t need to be a backpacker to enjoy these meals. They would be super for business trips when your stuck in hotel rooms, dorm meals to send your college student, to take to work, or just to keep in the pantry for a fast easy meal. Throw them together, boil water, wait a few minutes, and you have a tasty hot meal ready to go. While talking with our son, I mentioned we were planning this adventure and he said he would like to join us if we made the trip on a Saturday. We clearly thought this would be a great way to sneak in a visit and spend it hiking as a family like always. (Otherwise we would not be seeing him until Thanksgiving normally) So we worked out the best weekend and decided to leave extra early to travel a little further and pick him and his friend up from campus for the day. We left home at 4:45 am and picked them up at 9am to head back to the park arriving about 11:00 am. 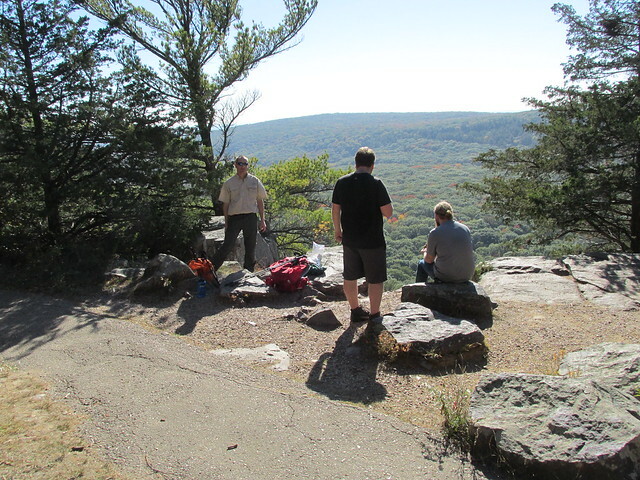 Our goal was to make it to the top of the first cliff and have a picnic lunch together. Upon arrival it was gorgeous, not too hot and very sunny. We stopped a few times to take pictures and let his friend take in the view. 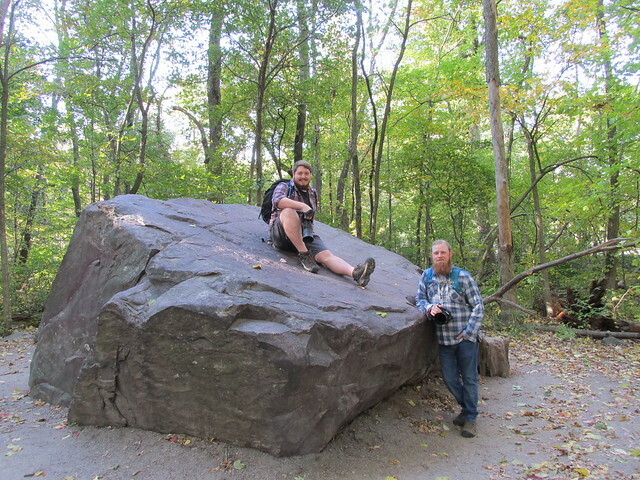 This park has my favorite terrain to hike, boulders everywhere. I have climbed this trail numerous times and it never gets old. Upon reaching the top we found a fairly flat boulder on the edge of the cliff, off the beaten path and enjoyed a nice spread of picnic foods and some catching up with the kids. It was so nice to sit and talk. After lunch we headed to Devils Door. This is a spectacular rock formation at the very top of the cliff. Popular for many different reasons. Here you can find rock climbers, scenic helicopter rides and hikers that love to climb into and out to the edge of this formation. The colors of Autumn were just beautiful from this view. Then it was time to head back down and refill water bottles for the next hike. This one is a killer, but well worth the view at the top. Unlike the rock climbing on the other side, this side is mostly paved with many steps built into the the path. The incline is steep and exhausting. The view from the top is breathtaking and so worth the effort. When we reached the top, we had the opportunity to watch some rock climbers do their thing, which is always exciting. From this side we could look over and see the side that we had just climbed. It does not seem so high until you see it from this angle. After this we hiked back down and headed to our next destination, our campsite. The town that our son’s campus is located in is very small, has a total of two hotels and they are by far, not the nicest hotels to stay in. So, we had planned ahead and decided we would camp at a near by state park. We really wanted to have our tent set up by dark so we decided to bring freeze dried meals and all have dinner together at camp before returning the kids back to campus. Ahead of time we had informed our son of this plan, and told him to ask his friend which meal she preferred to have in freeze dried form. We reached the campsite and my husband starting setting up the tent while my son and I started getting dinner ready. This was his friends first experience with a freeze dried meal, so when he opened her meal of choice and showed her the inside she was somewhat speechless. I couldn’t help but laugh at her facial expression. Thankfully we had enough picnic food left over from lunch just in case. Everyone’s boiling water was added to their meals. When it was time to start my husbands meal of choice, chicken breast with mashed potatoes, his needs to be done in steps, so I took out the freeze dried chicken breast and placed them on a plate. She was again rendered speechless, and just turned up her nose. I guess you had to be there to realize how funny it really was. They began measuring out the proper amount of water for this meal, looking like two mad scientists doing an experiment. While we waited for this meal to be prepared, it was time for her to take a look in her bag and see the outcome of her chili mac after it sat with boiling water for the required time. I don’t have a picture of this expression because I was laughing too hard. Although, she opened her bag, tried it and said it was pretty tasty. She took a picture to document her first freeze dried meal for future reference. It must have been edible because she ate the entire meal. It was a fun dinner with lots and lots of laughs. Then it was time to bring the kids back to their dorms. We did stop for a quick Dairy Queen dessert before dropping them off and saying good bye. They both seemed to have a great time, and enjoyed their well needed break from campus life for a few hours. I have no doubt they were both feeling a little stiff the next morning from hiking, but they are young, they should recover fast. 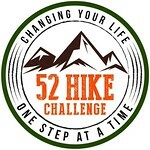 We told them on the second, more strenuous hike, we were helping them keep off the freshman 15 lbs. that everyone talks about. I don’t think either one believed us though. All in all, we had a great day with them. We were tired by the time we headed back to our campsite for the night but were confident after seeing the two of them that they are getting along on their own just fine. As a parent, you never really know what will happen when they go off to college, but mine seems to be doing quite well and that makes me feel good.